Online adaptive radiation therapy targets oligometastatic disease. Bowel cancer is notoriously difficult to treat. Often, stereotactic body radiotherapy (SBRT) is employed, but precisely targeting the cancer is a challenge, and radiation that is delivered to the bowel rather than the tumor can cause significant side effects. The lack of certainty in radiation delivery makes it difficult to assess the treatment's efficacy. "The bowel moves separately from the abdomen and at a different rate, so we don't know exactly how the therapy is going," says J.J. Nuyttens, MD, PhD, a radiation oncologist in the department of radiation oncology at Erasmus MC, the largest university medical center in the Netherlands. "You can make a very precise plan, but you're never going to know what the actual dose was that was delivered to the bowel." To improve the tracking and treatment of bowel cancer, Erasmus MC is undertaking a nonrandomized single-arm phase 2 clinical trial to evaluate a new treatment regimen for a particular type of bowel cancer, oligometastatic disease. This disease occurs when cancer cells from the primary tumor travel to other parts of the body and form fewer than six lesions. The cancerous cells are in an intermediate state; they are no longer confined to their initial location, nor have they spread widely throughout the body. Erasmus' physicians will be treating patients with online adaptive SBRT (OA-SBRT), a new type of SBRT. Rather than developing a treatment plan and strictly following it to the end, the new protocol will evaluate patients each day with a CT scan and allow physicians to make changes based on treatment response. "You create the plan at the time you create your first image, and that's your 'reference plan.' And then every day you acquire an image, and you compare it to your reference plan," says Fabienne Hirigoyenberry-Lanson, PhD, vice president of global medical and scientific affairs at Accuray. "The patient comes every day for the treatment. You acquire an image, and then you adapt the plan based on the image of the day. 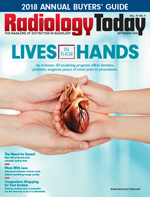 The system collects feedback that integrates CT data from imaging recorded during the treatment course and the best treatment plan allowing reduction of the radiation exposure to the organ and a further escalation of the dose to the tumor is delivered." "That's a huge difference from 99% of all treatment plans," Nuyttens says. The clinical trial will evaluate the use of OA-SBRT for the treatment of oligometastatic disease in the pelvic or paraaortic region, which is challenging because there can be significant variation in the position of the abdominal organs from day to day. Fifty-three patients will be enrolled and followed for three years. A prescription dose of 45 Gy will be delivered in five fractions by Accuray's CyberKnife System, provided the patients are able to tolerate the treatment; conventional radiation therapy is typically delivered in much smaller doses with many more fractions. The primary study objectives are to evaluate local control, survival, and toxicity. "The question is, will you treat the patient today or not? If you decide to treat, how much dose will you deliver? You want to use at least the same dose as you would use for conventional treatment, but you want less dose in the organ that is at risk," Nuyttens says. "You need to have different treatment plans that you can deliver so you can decide what kind of plan you will use." Thus far, one patient has completed treatment with no side effects or signs of active oligometastatic disease. A second patient has also had favorable results. Nuyttens says patients need to be cancer-free for five years before they can be considered "cured." He adds that the five-year survival rate for oligometastatic disease is 30%, which is high for patients with metastases. The new protocol adds approximately 15 minutes to the treatment time, but Nuyttens is hopeful that the results will prove to be worthwhile. "We hope to see fewer side effects, not only short term but also long term. And the local control of the tumor should be at least the same," Nuyttens says. "We don't just want fewer side effects; we want the same outcomes and tumor control." Hirigoyenberry-Lanson says the online adaptive approach can work with other conditions as well. Accuray is actively seeking organizations that are willing and able to partner on new applications and develop new protocols. Hirigoyenberry-Lanson believes radiation treatment will increasingly be informed by imaging. "I think that imaging is the key to improve patient care," she says. "We want to bring patient treatment to the next step, and online adaptive is certainly one of the key ways to get to that."